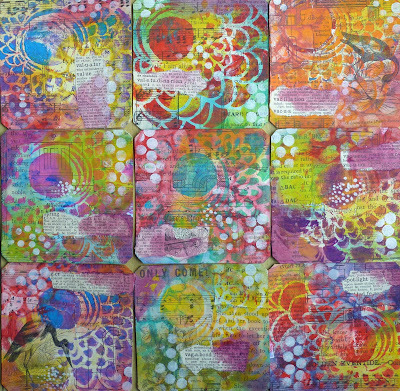 I have been sharing some techniques to make art cards with you already but having to produce 365 this year has made me think about the many and varied methods that can be used. In fact, it has already been a very useful project for me from that point of view. Let me remind you about the #365somethings2018 project. The idea is to do something artful every day of 2018. It doesn’t matter what, so we could all make our own choices. 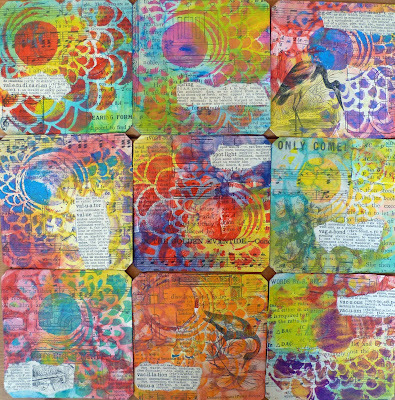 I decided to go with making 365 3 x 3” art cards. I’m not making one a day. Rather I make them in batches; some days I make backgrounds for about 9 or 10 cards, on another day I might add some collage to some of them, then maybe rubber stamping and of course stenciling! 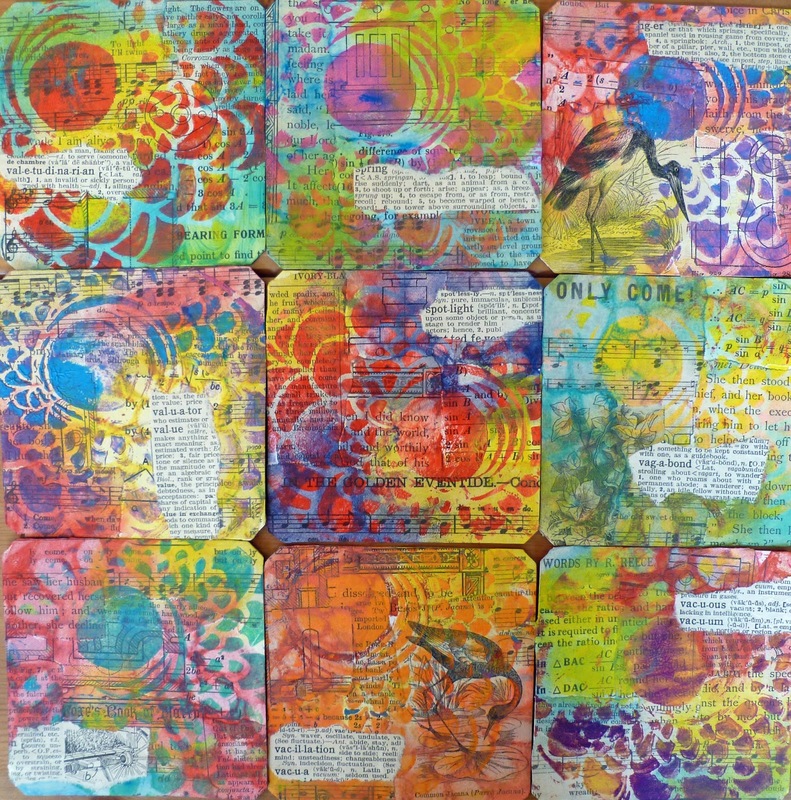 The final touch tends to be the text and then I date stamp the cards and upload one a day to my Instagram feed. 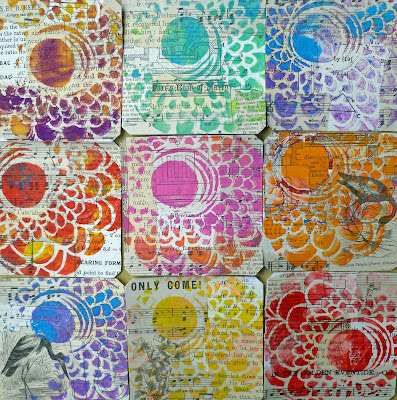 As monthly Guest Designer for StencilGirl® I have shared two loads of nine cards with you already and here is the third. What never ceases to amaze me is how each lot of cards ends up looking totally different, despite being made by one person. 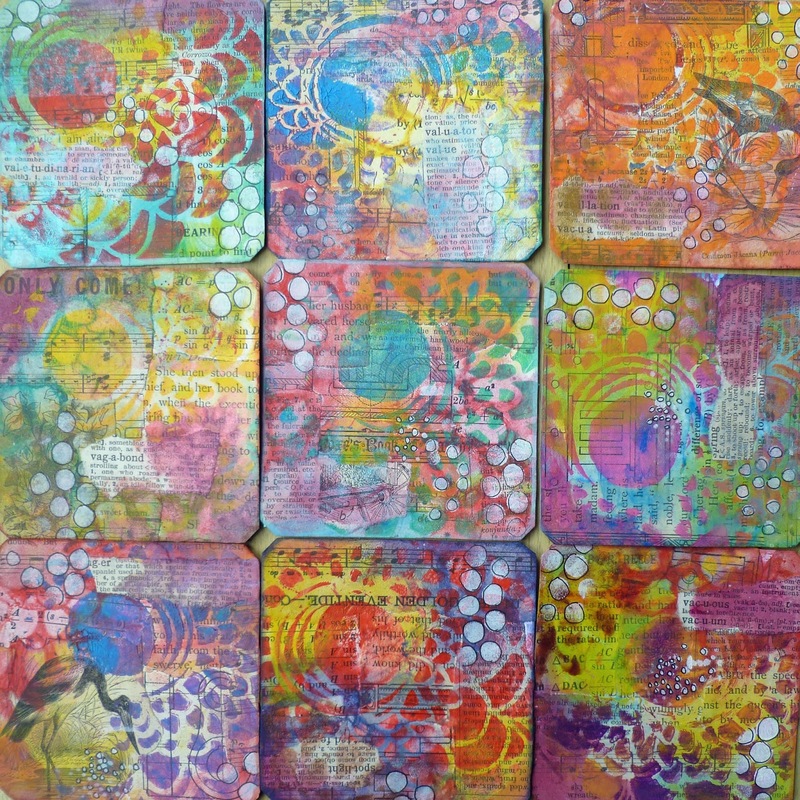 Of course the stencils you use help to produce that very varied effect. 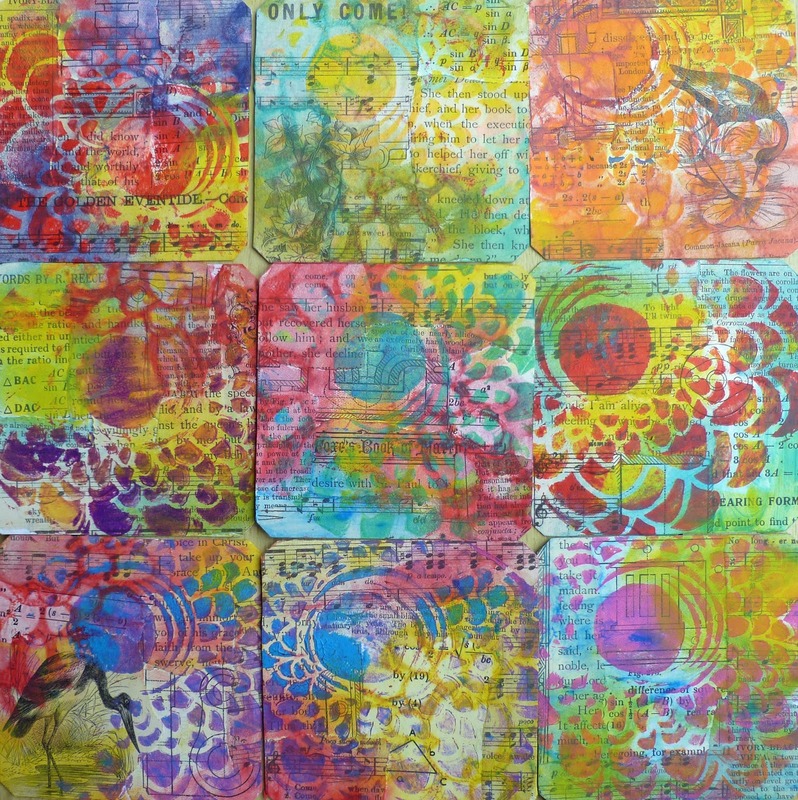 Try using different stencils from mine and you can see this for yourself. 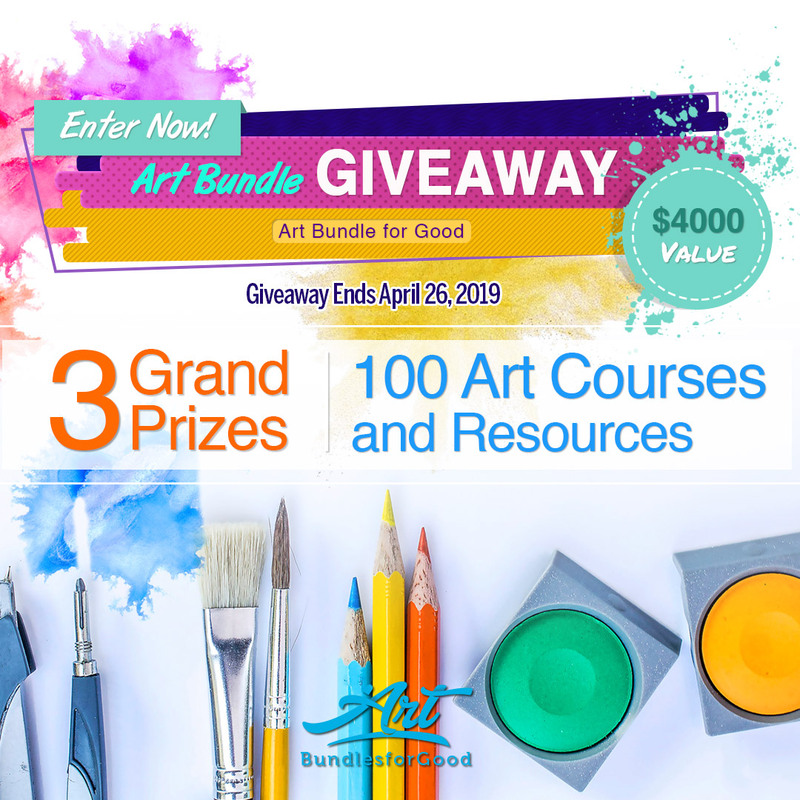 Hope you will enjoy making your cards along with me. 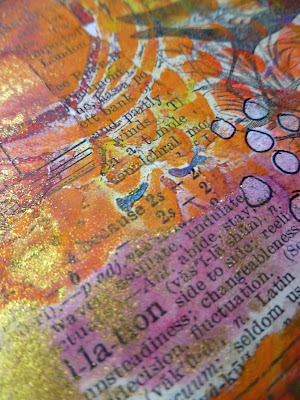 And of course, the techniques can also be used in art journals or much larger canvasses. 1. 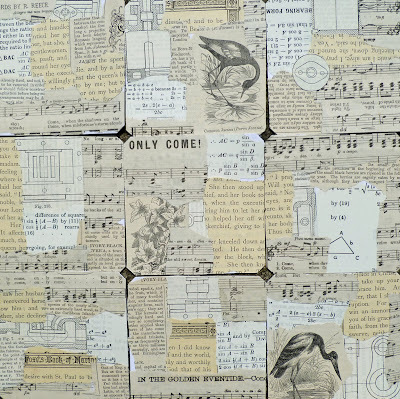 Tear out some pages from vintage books and collage bits of each page onto the cards. Fill the cards completely. I used vintage dictionaries, music sheets and a vintage technical drawing book as well as a children’s book. 2. Get out a gelli plate. Size doesn’t really matter, just make sure the plate is larger than your cards. I used a 6” circular plate. 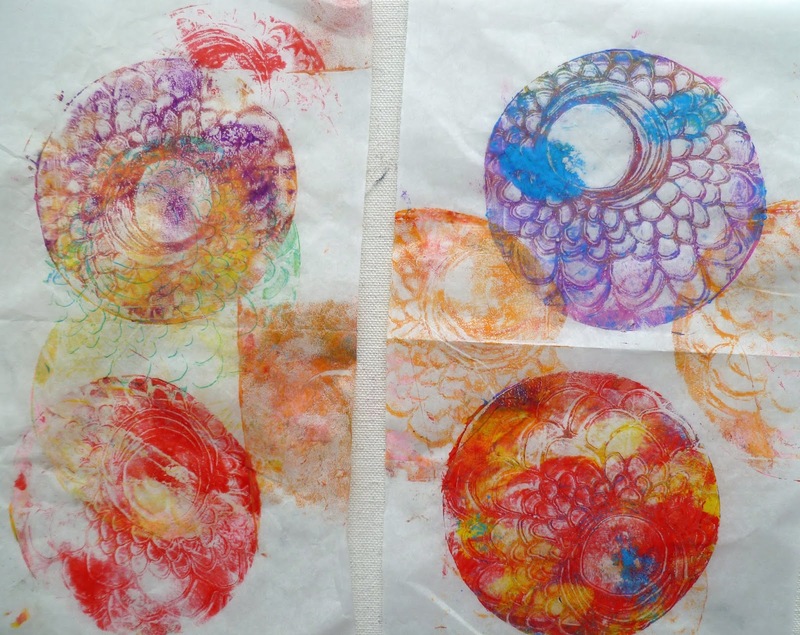 Add two colors to your plate, brayer them so that the plate is covered but you can still see two separate colors. 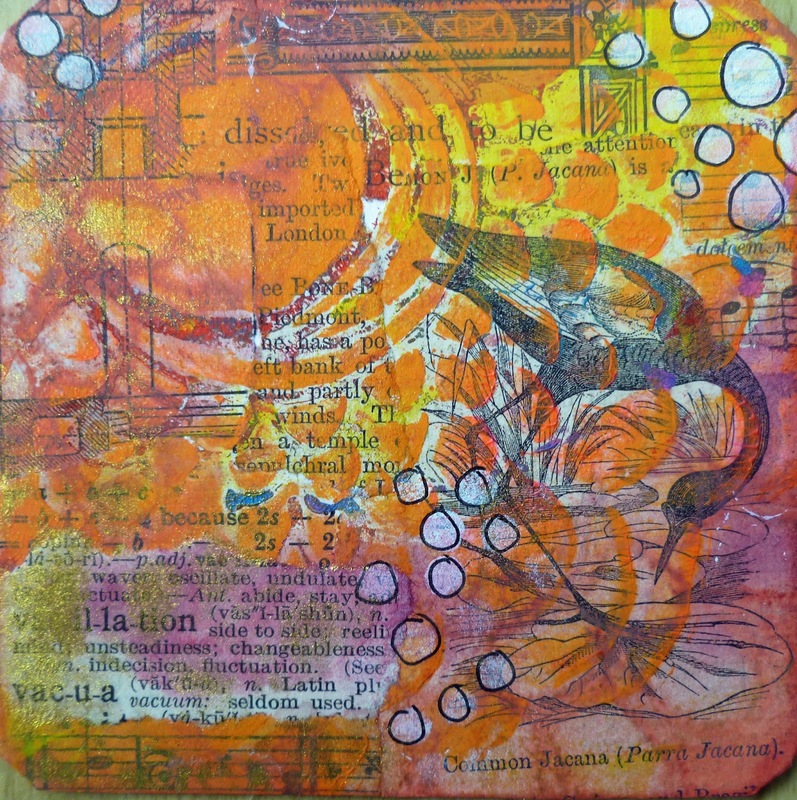 Put Traci Bautista's Deconstructed Double Zinnia on top of the painted gelli plate and press the art card to the surface. Press quite hard before lifting to get the print. I used different colors for each card so needed to clean the plate after each pull. 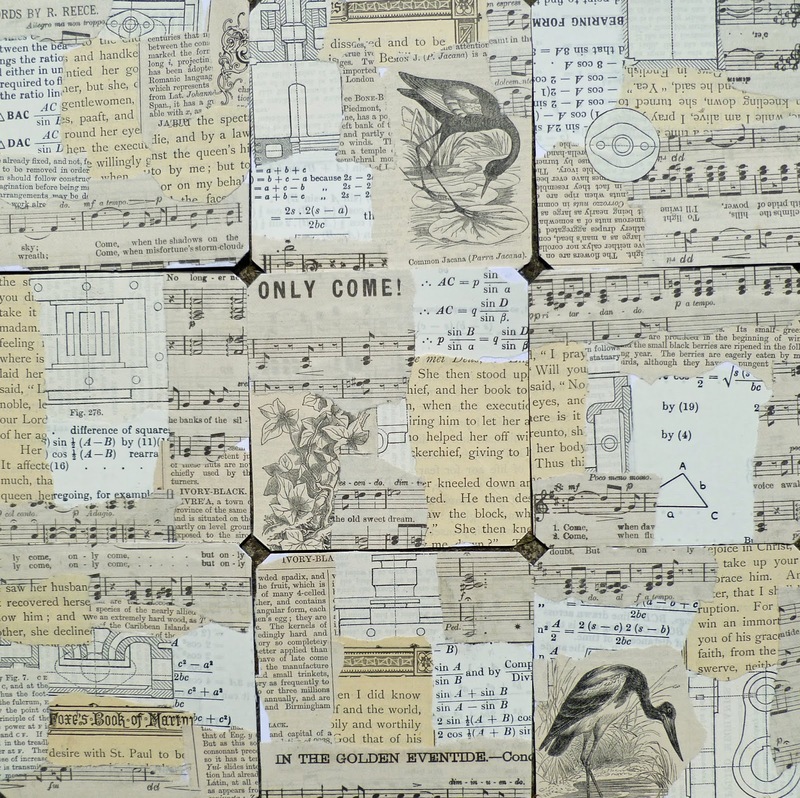 I used that opportunity to make some deli paper for collage. 3. Add additional colors to each card (I used my fingers but a brush is also perfectly okay!) and rub away some of the color again with a baby wipe through Rae Missigman's Nonsensical Bloom Stencil and Mask. 4. Add more collaged text from the same sources as in step 1. 5. Rub on some color onto the text added in step 4 to integrate it into the cards. 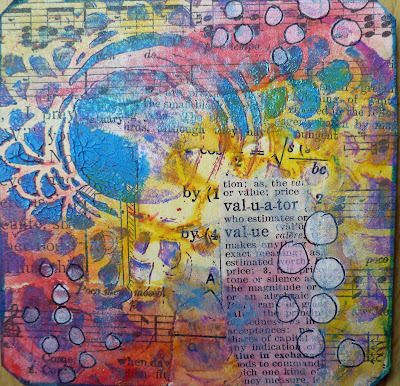 I used some Lindy’s Magicals mixed up with water. 6. 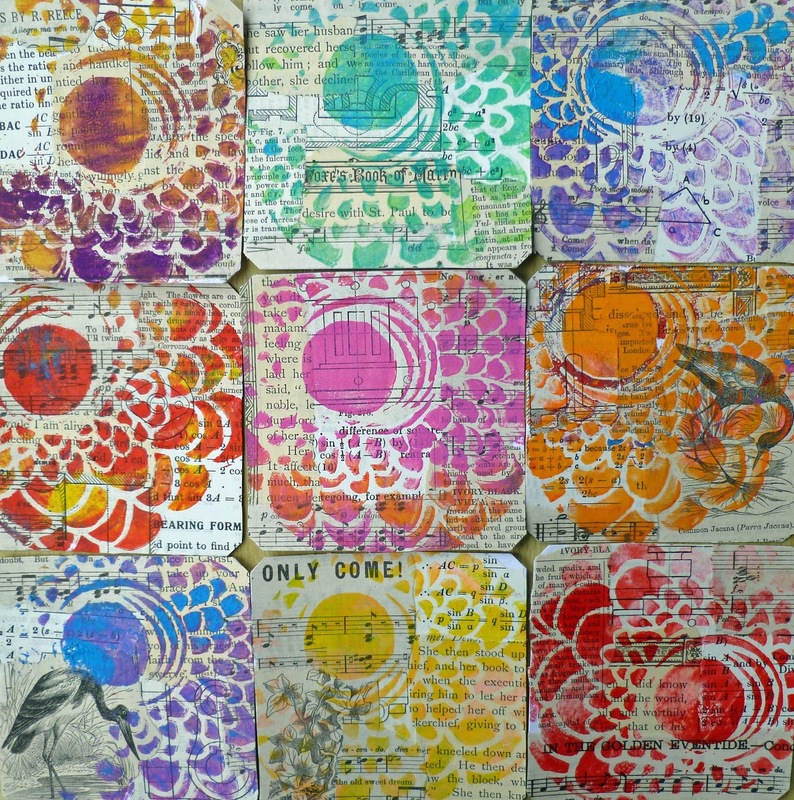 Using titanium white paint and the small stencil from Mary Beth's Private Collection 14.3 stencils add white circles in various sizes to the cards and outline with a permanent black marker. 7. Using mica sprays in different colors add some sparkle to each card through Nonsensical Bloom Stencil and Mask. 8. 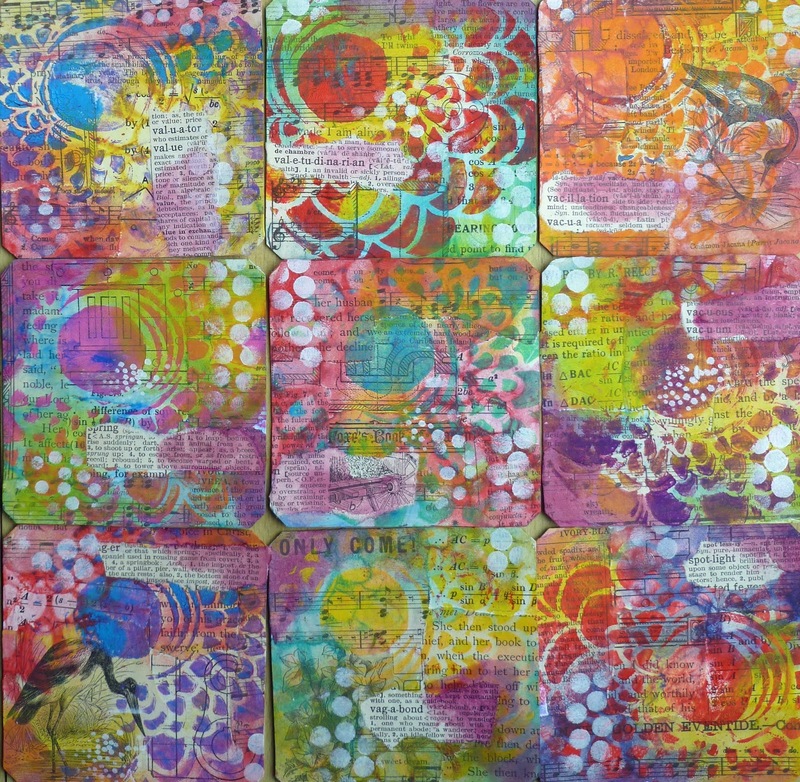 Edge the sides of each cards using a permanent ink pad in a color that matches each card. Oh, what a feast for my eyes! Such loveliness and the colors are happy and bright. Thank you, my friend, for the sweet visit to my blog the other day. It's so good to be back. Hugs! Thanks for the WOYWW visit. I now have a quiet house and some time for fun things. Really love your doodling and Thanks for showing these art cards and walk thru . I just got a Gelli plate and enjoyed using it one time...then company came. So hoping to get back at it.